Ever wanted to be the master of a guild of heroes? Hopefully you said yes, because the land of Crystalia needs you! As the guild master, you make the call of whether and when to answer pleas from the public, take on bounties, or just answer the call of adventure. You will combat the Dark Consul’s forces time and again. Will you succeed, or watch your party fall in battle? We’ll look at the quick play mode since the campaign mode is not available in the demo, but it sounds like it will be quite deep when the full game comes out. You will build up your heroes into mighty warriors by acquiring loot via main story quests, side quests, and random bounties. There will be a wide variety of enemies and game progression will be loot based. This is so you don’t end up with some heroes being left behind in leveling because they haven’t been used as much as others. Once you set the graphics resolution and controls in the launcher, you will find yourself on the main menu screen (shown above). When starting a new Quick Play game, the first item of business is to set up your party of heroes. How you setup your party is not overly important in the first levels, and sounds like it will be much more important in the full game’s campaign mode. There are eight heroes to choose from, and the size of your party may vary based on the selected level. For example, the first Quick Play scenario lets you make a party of three. 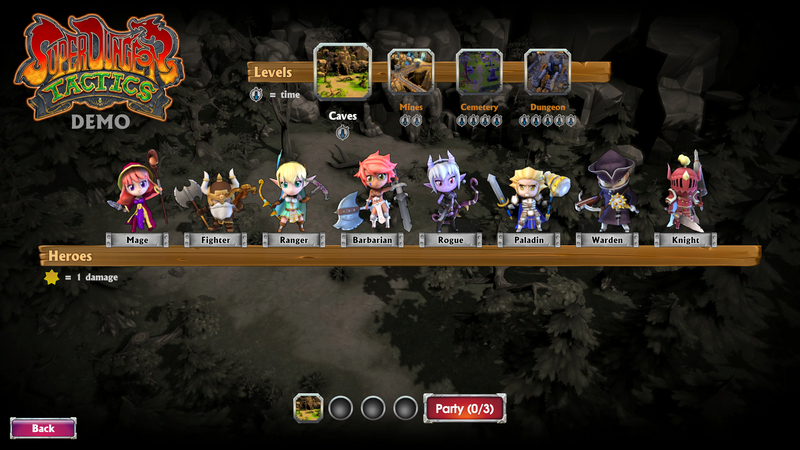 The second Quick Play level allows four heroes in the party. The heroes are the Mage, Fighter, Ranger, Barbarian, Rogue, Paladin, Warden and Knight. Party setup and level selection screen. Most of the heroes have two weapons to choose from on this screen, as well. Which weapon you choose determines their main attack and its range. With your party all setup, you need to click on one of the four levels at the top of the screen to choose it. Its picture will appear beside your party at the bottom of the screen. Once all party slots are filled with a hero, you can start your Quick Play game. Customize the arrangement of your party before the battle starts. 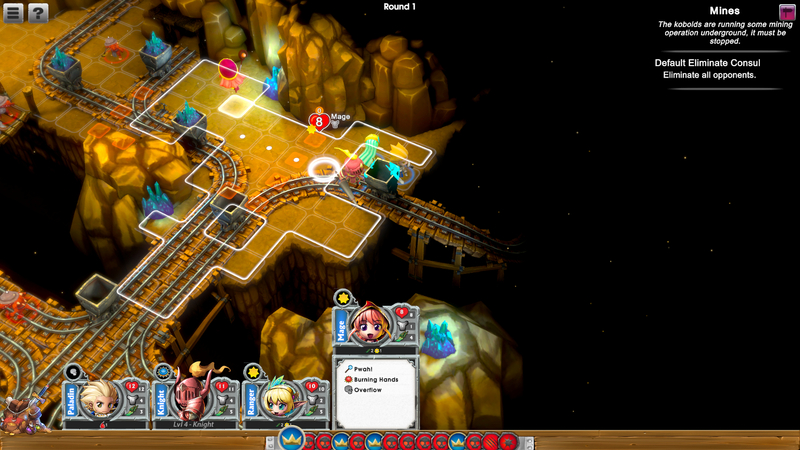 After a few seconds, the first segment of the Super Dungeon Tactics level will load. You get your first glimpse of your foes, and your party is enclosed in a blue box on the ground (shown above). The size and shape of that blue box varies from level to level, too. At this point, you may rearrange your party within that box. Clicking the green “READY” button will start the battle. Every turn starts with a setup phase where you can assign a die to each of your heroes. Different dice have different effects ranging from stat boosts to enabling a special move for that turn. The group of dice you have to choose from is random, so you have to make do with what you have for the turn. Assigning dice to your heroes. 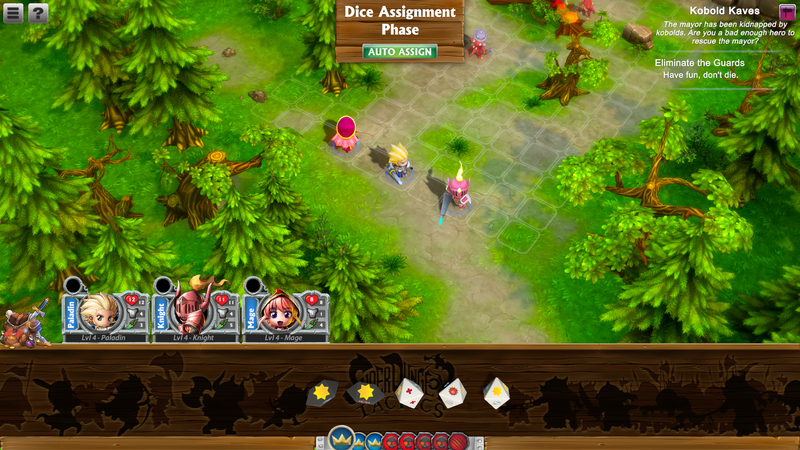 At the beginning of each turn in Super Dungeon Tactics, a bar slides up from the bottom of the screen and the random dice roll onto it (shown above). You can only assign one die per hero. For example, the die in the screenshot above that has a red + symbol on it which will give a health boost to the hero you assign it to. Other boosts you can get include power and movement range. In the screenshot below, I’ve moused over the Paladin card at the bottom of the screen to make his character card pop up. You can see his stats on the top, and his moves on the bottom. The Quick Prayer move is a special move. It can only be used if the die assigned to the paladin this turn has the matching symbol. His third move is Backlash, and has a skull symbol. He needs a die with a skull symbol assigned to him to use that move in this turn. The tutorial says that the skull moves are usually bad, as they can have disadvantageous effects in many cases. You may notice a column of items on the left of the screen in the image below, too. This is viewed by clicking the pack in the lower left corner. It gives you access to useful things like food and potions should you get in a pinch! 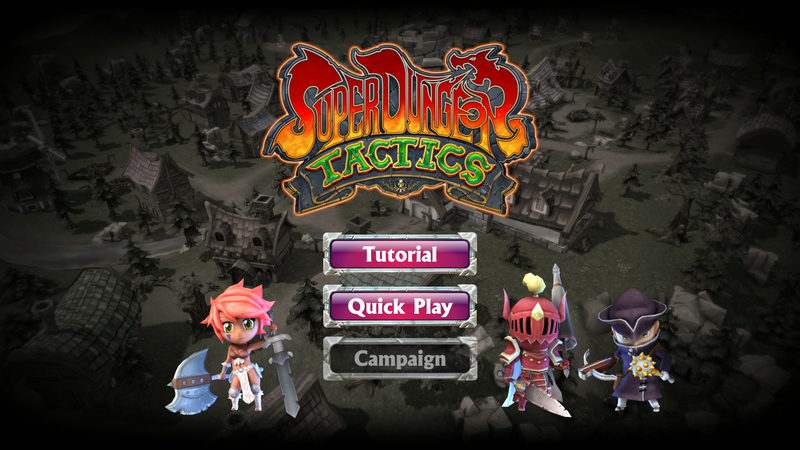 The gray button with three lines in the upper left corner of the screen takes you back to the Super Dungeon Tactics main menu (after a prompt). The ? button is the help button, but it is nonfunctional in the demo. There is one more thing you may have noticed that we didn’t cover yet. At the very bottom center of the screen is a row of tokens. These show the turn order. Blue tokens are turns for your heroes. Red tokens are enemy turns. Turn orders can change randomly, as well, making battles slightly more interesting. You can move a character more than once during his/her turn if they still have movement points left. After moving your character to the desired location, press the Spacebar to display a circle of options around him and choose an action. The controls can be changed in the launcher. As you drag your hero around to the desired spot, you’ll notice some squares surrounding the hero are highlighted red. The screenshot below shows this. 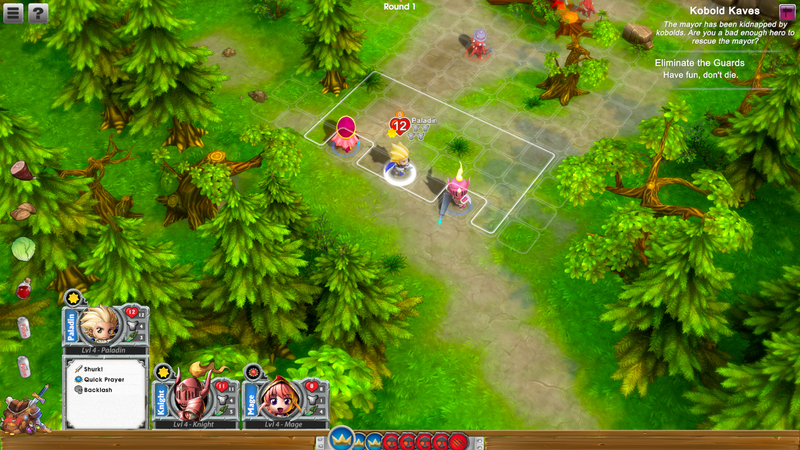 Those red squares indicate which tiles the hero can attack from his current position. So you want to move the hero so that one of those red squares is on the enemy you want to attack. This oswhere strategy comes in, as you need to pay attention to the positions of other enemies who may move in and attack the hero after his turn. 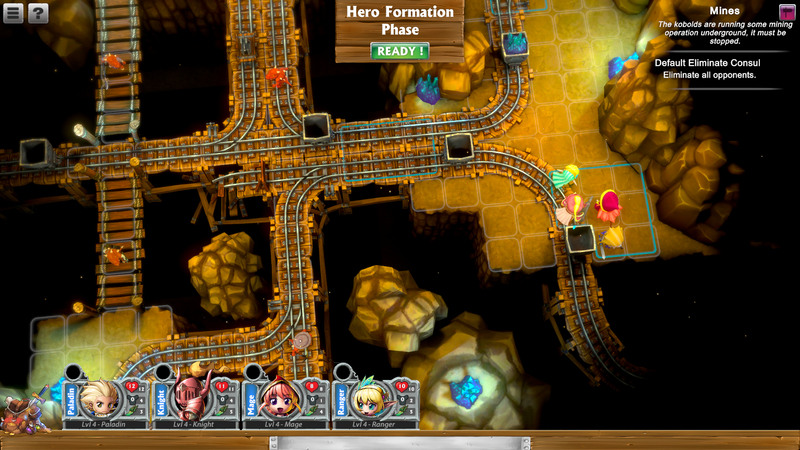 This is the essence of battle in Super Dungeon Tactics: deciding where to position your heroes, and what moves to use to hopefully come out on top when the dust settles. The demo is quite limited, but the game has a ton of potential. It is an enjoyable experience and the gameplay is fun in spite of a few minor issues. There are a couple typos in the tutorial dialog, but that’s not much of a problem. Bizarrely, there is no exit option on the main menu, which is very annoying if you play in full screen mode. You’d expect that maybe the Exit key would work, but alas, it does not. So the only way to exit the game is to Alt+Tab out of it if you are on a Windows machine and close it from the taskbar. The rest of the game is fine, though. The music is quite well done and provides some great ambiance to the experience. The sound effects also do their job pretty well in Super Dungeon Tactics. The overall presentation for the game is put together pretty well. 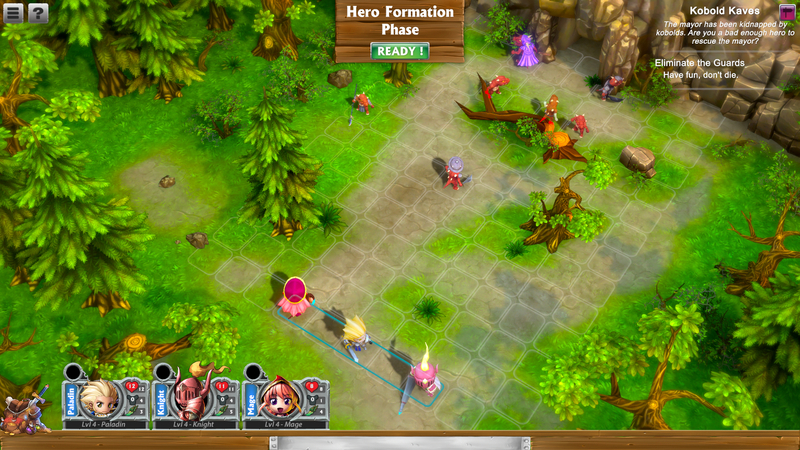 Super Dungeon Tactics is fun, and it sounds like the campaign mode in the full game will be quite deep. The game is set to make its launch on December 14th, 2016 on Steam. It will be available for Windows, Linux and Mac OS X according to the website. The price of the full game is not known yet. The demo levels are fairly short so playtime is just a few hours. Of course, the more you replay the demo scenarios to experiment with different party setups, the more that number will go up. I enjoyed my time with the game and it will be very interesting to see how the final game has shaped up.